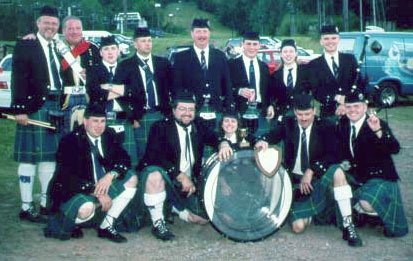 The Monaghan Pipe Band placed for the first time in a foreign contest with a second in Montreal. Back row of pipers (L - R) Mary Hamilton, Pipe Sgt. 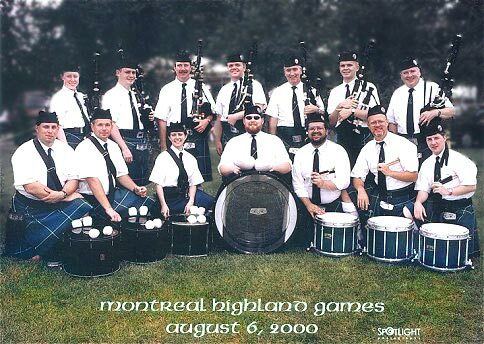 Byrne O'Sullivan, Pipe Major Tom Hoins, Eddie Cameron, Ken Meagher, Lachlan Cameron, Joe Brady, Jr. Front row of drummers, Tenor Rob Cirincione, Baritone Joe Jacobs, Alto Marianne Marcellino, Bass Dan Hamilton, Lead Drummer Martin Duffy, Snares Gregory McLaughlin and Richard Janniello. Monaghan continued to build up a mighty pipe corps with two key pick- ups for the 2000 season. Joe Brady, Jr. (Right) played his first season with Monaghan and John Wassman played with the band in the later part of the season as its instructor before becoming the band's pipe major. Both John and Joe are accomplished open pipers with a history of playing in top bands. 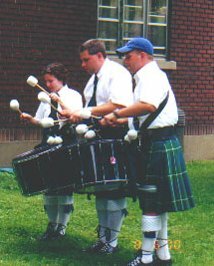 (L - R) Marianne Janniello, Rob Cirincione and Joe Jacobs made up Monaghan's dynamic tenor line which debuted in the 2000 competition season. Monaghan was sure to find its way into the closest and most debated Presidential election in history. The band played at the request of George W. Bush during a New York stop on the campaign trail. Here, the then Republican candidate shakes hands with Joe Brady, Jr. There was no better way to end up a pivotal year then with the wedding of not one, but two of our drummers. 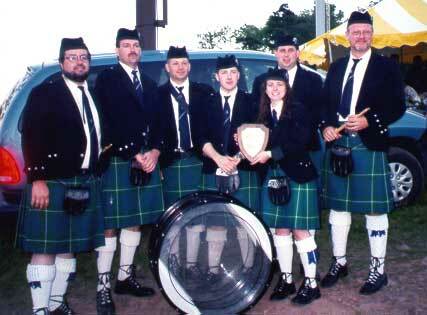 Marianne and Richie pose for a shot here with their Monaghan Pipe Band.